When I was sent a sample of the LFGF Gluten Free Bread Mix I realised there was NO WAY I was going to make it up in the traditional way if it was to be a viable solution to my gluten free bread needs. And – tada! turned out BEAUTIFULLY! So nice that Rish was quite content stealing half my first slice ;) Was yum with a bit of margarine, and no weird texture issues. It’s also not too dense, because it has yeast in it it gets nice and fluffy. INGREDIENTS: Tapioca flour, besan flour, potato flour, maze starch, rice flour, LSA (linseed, sunflower, almond) almond meal, sugar, vegetable gum (415, 412), raising agents (450, 500), salt, food acid (334). 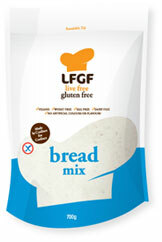 The bread mix is $14 for 700g, $52 for 5kg, or 10kg for $99, plus postage from lfgf.com.au. The bigger packs work out around $7/loaf, which given how great it tastes is pretty good value in the gluten free world! The small pack is obviously not that great value, but if it’s just to try, before you shell out for 5kg, it might be. ohh that seems like a lot of work ;) I’m more a fan of set and forget, but thanks for the tips!